It was my first time living away from home. 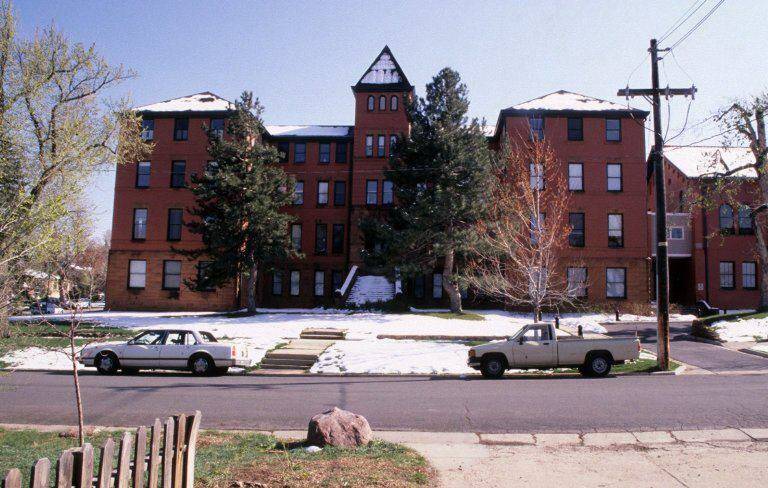 I had been banished from my mother’s house in Denver, Colorado and sent away to an all girls catholic boarding school 30 or so miles north-west in nearby Boulder, in the hopes they could do something about my incorrigible behavior. It was a tough time in my short life, I was 14 and a freshman in high school. I hadn’t done anything horrible, especially when measured by today’s prism; but I was having a tough time in school… bored; in friends… wrong crowd; in love… dazed and confused. I remember as we drove up to the school that cold winter’s day and I laid eyes on the old building that was original completed in 1892, that I thought there were bars on the windows. I felt dwarfed by the impressive building that housed the school which was founded by the Sisters of the Blessed Virgin Mary from Dubuque, Iowa. Originally built to serve students from all over the world, particularly those with tuberculosis, it had become a refuge for parents who needed some place to send their “difficult” girls. The school also accepted “day students”, girls who did not live at the school, but came each day from their own homes somewhere in the local town, their parents expecting them to receive a catholic education in an environment with no distractions… code for no boys! We were affectionately known as “Gerties Girls” who under the guidance of the BVM sisters, would receive a first class education along with the discipline that our parents were unable to instill in us; I doubt it some of the things we learned was quite what that the nuns and the parents had in mind! Everything at the school was difficult and disciplined. We lived in dormitories, usually 6-8 girls, in curtained alcoves that contained a twin bed and a dresser, nothing more. Each dormitory also had a supervising nun, whose alcove was slightly more permanent. It had a locking door attached to four wood paneled sides that stretched upwards but stopped short of the ceiling by about two feet. This allowed the resident sister, who would serve as a supervisor to her dorm, to hear everything taking place, yet have a little more privacy than was afforded the students. Each night the girls would retire to their alcoves, pull the curtains and wait for lights out at 9PM. We sometimes would play tricks on our supervisor like removing the piece that held the door to the hinge… we were rebels, all of us! By today’s standards though, quite tame. Along with our school work, the girls were encouraged to participate in the school sponsored social activities which ranged from field trips to functions held on the school property. The trips into town were most often to the Hill, a neighborhood just on the outskirts of the campus of University of Colorado (CU), to shop in the college book store, try to sneak into the Sink or the Hub, both of which were bars popular with the university students, or to sit in the Gunslinger, another local hangout, drinking our cokes and watching the college kids cruise up and down the main street. The organized social functions held at the school were typically in the form of dances, chaperoned usually by the nuns themselves. During my first year there at Gerties, the first school dance was to be a Valentines Day dance. Typically the day student’s would invite their local boyfriends, but the boarder’s had to find other ways to invite a boy to serve as her date for the function. I invited Earl Jacobsen. It was my first blind date. I don’t remember where I got Earl from, all I remember is I was thrilled that I had a date for the dance! Somehow I ended up with a red dress to wear, don’t recall if I went shopping for it or borrowed it. The day of the dance was filled with the usual preparations, hair done, make-up applied, but barely… catholic school you know! Earl arrived promptly at 7:30. I met him in the main entry hall and he escorted me into the Gymnasium where the usual basketball activities and sounds of balls bouncing were replaced with red and white streamers, a table full of refreshments and distorted music blaring through the PA system. My dress was a simple A-line red velvet dress, with a black bow gracing the neck line, white lace trimmed the edge of the fitted long sleeves. Our dress length for the uniforms we wore daily was determined by the “Gertie code”, the hem of the dress must brush the floor when in a kneeling position. Inspection of school uniforms for length was common. We, of course, found a way to still wear the shorter skirts that were in style – after all it was the time of the mini’s – by rolling the waistband until the desired length was achieved. Then all one had to do when a surprise inspection took place was to tug on the sides of the skirt un-rolling the gathers from the waist as the knees bent towards the floor to assume the inspection position! See what I mean about education?! My dress for the evening, however, could not be rolled at the waist and so it was the appropriate length to pass inspection. Earl had brought with him corsage for me as was customary. It is the first time I remember getting flowers from a boy, He fumbled nervously as he pinned it to my dress just below my left shoulder. I blushed hearing those words. I was embarrassed and flattered all at the same time! But mostly I was shocked that he was so forward as to even say that to me! We stood there together most of the night, and after a time he took my hand in his. I felt a warm glow spread though my body and a genuine sense of excitement and embarrassment filled my heart. The next morning I was called into Sister Mary Ann Regina’s office, the principal and mother superior for our school. She chastised me for my behavior at the dance. We did nothing but stand together holding hands, no dancing, no kissing. “It is not appropriate to hold hands until the 5th date!”. I had many experiences at Gerties. But this one will always stand out. I remember hearing Duke of Earl playing sometime during that night and my friends and I would laugh in the coming days about Earl, and always sing the familiar intro “Duke duke duke, duke of earl, duke duke, duke of earl…” chiding me about Earl and we would laugh and laugh. The details have become a little fuzzy and I often wonder whatever happened to Earl, he wasn’t the first boy to hold my hand, but the comment about the dress and the chastising for holding hands holds a special place in my memories… another lifetime ago, when life was simple.